Headquartered in Manassas, Virginia, Aurora Flight Sciences has more than 550 employees and operates in six states in the U.S. including a research and development center located near MIT in Cambridge, Massachusetts, manufacturing facilities in Bridgeport, West Virginia and Columbus, Mississippi with offices in Dayton, Ohio, Mountain View, California and Luzern, Switzerland. Aurora recently announced its acquisition by Boeing. Once the acquisition is complete, Aurora will be a subsidiary under Boeing Engineering Test & Technology known as Aurora Flight Sciences, A Boeing Company. It will retain an independent operating model while benefitting from Boeing’s resources and position as the leading provider of aerospace products and services. John S. Langford is the Chairman and CEO of Aurora Flight Sciences Corporation, which he founded in 1989. Langford is a native of Atlanta, Georgia. He received his Bachelors degree in Aeronautics (1979), Masters in Aeronautics & Astronautics (1984), Masters in Defense Policy (1983) and Ph.D. in Aeronautics and Public Policy (1987) from the Massachusetts Institute of Technology (MIT). Prior to Aurora, Langford worked for the Institute for Defense Analyses in Alexandria, Virginia. While at MIT, Langford organized and led a series of human-powered aircraft projects, culminating in the Daedalus Project, which in 1988 shattered the world distance and endurance records for human-powered flight with a 72 mile flight between the Greek islands of Crete and Santorini. Earlier, Langford worked for the Lockheed Corporation as an engineer on the development of the F-117 stealth fighter. The following is our Q&A with John S. Langford, CEO of Aurora Flight Sciences. BPE: What is your definition of success? JL: I guess success really has to do with satisfying our customers, satisfying our employees and satisfying our shareholders. Meeting and exceeding their expectations. BPE: Do you consider yourself (or your company) to be successful? 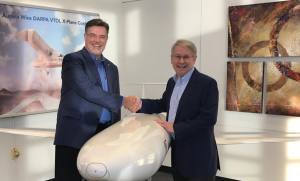 Aurora CEO John Langford (r) and Boeing CTO Greg Hyslop. JL: Yes, I do, actually. I’m sure you know about our recent acquisition by Boeing. We think that is a validation of the idea that we have been successful at meeting our objectives. BPE: What are the top 3 things you think have led to your (or your company’s) success? The other thing you have to have is a diversified portfolio. We are a needs-based company, so we’ve got a number of different programs going at any particular time. That diversification has saved us on more than one occasion over the years, because every program goes through its own life cycle. Every program has interruptions. You don’t know what it will be, but you know there will be something out there. So being diversified and yet retaining your focus is critical to success. The third thing is having a great team of people. We survey our employees – particularly in our exit interviews. Exit interviewees are really honest. They let you know what they think, and almost without exception, the thing they score us highest on is the team of people we have assembled here at Aurora. So yes, a diversified portfolio, flexibility and persistence, and assembling an amazing group of people would be the top keys to our success. BPE: Who do you consider to be your chief/stiffest competition and why? JL: We’re a small company in the aerospace environment, so there are a lot of ways to answer that question. There are other companies in our market space, which would be the unmanned or robotic airplane field, but I think our stiffest competition is actually other countries. Aerospace is a high-tech industry, and everybody around the world recognizes the importance and the stature of aerospace to their economy. We face competition, not only from other companies, but from countries who back their programs with taxpayer dollars. And so, we face a number of different companies who operate under a very different set of rules than we do. BPE: Do you have concerns about espionage? JL: Sure. I think there is no doubt that robotic aircraft technology is one the top things on the foreign intelligence acquisition list, but I also think there are a lot of elements that are not nefarious about that. BPE: Are there any people or companies that have failed that taught you a valuable lesson in what not to do? JL: Yes. I think every failure provides a learning opportunity. 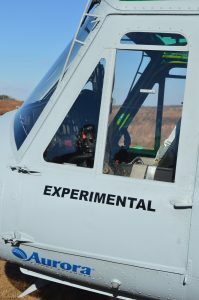 We have certainly watched a lot of our peers in the aerospace field and have certainly learned from those. BPE: How would you describe your leadership style? JL: I guess I try to ascribe to the maxim of surrounding myself with really excellent advisors and then listen to them and do what they say. That has served us very, very well over the years. A lot of the most important people at Aurora are not actually on the payroll. They don’t get a W-2. They are formal and informal advisors who can come from anywhere. I think that maxim also extends to our employees as a team. I believe in finding good people, allowing them to expand their horizons and work to their full potential. Trying to create that environment is one of the most important elements of what we do. BPE: With so much competition in the aerospace industry, what makes Aurora unique? 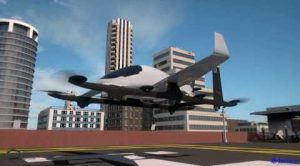 The Aurora eVTOL has been selected by Uber for it’s urban initiative. 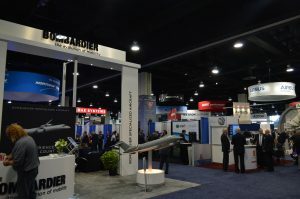 JL: I think the combination of the ability to be truly innovative in a business where the standards for innovation are pretty high, and to walk that line between having enough process and quality control that you can achieve the kind of standards that are expected in aerospace, and still be able to have the flexibility to respond faster than the competition. I like to tell our team that it’s not that there aren’t great people working for our competitors. Our competitive advantage is entirely our ability to respond faster. It’s very hard to strike that balance between process control and speed. A bias toward action is one of our core values and it has been critical to our success. BPE: What do you outsource versus keeping in-house in terms of work and staff? JL: We tend to be vertically integrated, but not crazy about it. These airplanes that we do, tend to be fairly complicated systems. And we tend to focus on the air-vehicle part of the system – the flight control, the autonomy, the structure, the propulsion systems integration. Then we outsource key components in things like the propulsion area, replacement units for some of the electronics, and very much so for some of the sensors and the payload the vehicles carry. In those areas, we tend to rely on other companies. BPE: What about your platforms? JL: Our platforms are pretty much in house. 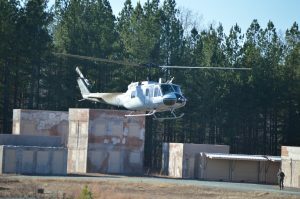 We have our engineering center here in Northern Virginia, we have a research and development facility up in Cambridge, Massachusetts, and we have two production sites: one in Clarksburg, West Virginia and the other in Columbus, Mississippi. BPE: How do you think your employees feel about your leadership style? JL: (Laughing) I don’t know – you’d have to ask them. But I think they like the environment that we’ve built. BPE: What problems have you encountered that you feel you (or your company) dealt with in a particularly successful way? JL: One of the real challenges for us has been being a small company operating in an industry full of giants. Particularly when we started thirty years ago, it was very unusual to have a start-up in the aerospace industry. When you look at the 100 top companies in our business, none of them were younger than about 25 years old. This is not a social network kind of field, where you and I could come up with something in our dorm room and ten years later be a ten billion dollar company. This is very much an industry of complex systems, difficult to manufacture components, very high levels of quality assurance. There is an investment which has to go into all of that, and it’s a challenge for a small company to operate in that environment. I’d say that has been our central challenge over the last twenty-five years. BPE: Tell us about your investors: How did you get investors to buy into your company? What advice would you give to a startup looking for investors? JL: The investors in Aurora have been of a couple of flavors and have varied over time. The earliest investors I would liken to the classic story of friends and family. You start with personal assets. We got early support from a family foundation up in Massachusetts that was interested in supporting global climate change research. A couple of early investors were interested again in global change, but also in proving you could operate viable businesses while trying to do environmentally sustainable objectives. The whole doing well, while doing good, kind of thing. As we’ve gotten larger, we’ve moved more into the traditional private equity. We did a series A around 2003, so we’ve also gone through that cycle. There have been other financiers in there as well. BPE: How many employees did you start with? JL: On the first day we hung out our shingle, there were three of us. Today there are about 550. BPE: What is the hardest thing about managing employees? JL: Well, your number one job, if you’re running a business, is to meet the payroll. Some days that’s easier and some days that’s harder. It’s a persistent challenge that hangs over the head of anyone who is running a business. BPE: If you could do this over, what, if anything, would you change about your company? JL: That is a very good question. It depends on what time. Are we talking about doing it today or rolling back to the same time frame? Aurora has spanned a period of time of what we now call the drone industry. When we started in 1989, you had to explain to people what a drone was, much less what we were doing. Today, you don’t have to do that. Some of their ideas may be wrong, but everybody thinks they know about drones. So, in one sense, we timed it very well. We got into the robotic aircraft business at a time before it really caught on, so we’ve been able to be an established player over the last few years when it has really taken off. BPE: What is your company’s mission statement? Has it changed at all? JL: Our mission is to apply autonomy and robotics to the development, production, and operation of advanced aircraft. That core mission has not changed since we started the company. The same technical threads of flight controls enabled by computers, sensors and algorithms, structures and propulsion have underlined our business from the very beginning. But our first mission statement was to develop these robotic airplanes for global climate change research. We were set up in 1989 to enable a whole new approach to doing stratospheric or atmospheric research, and our focus was very much on that particular mission. As the company has evolved, the same underlying technology drives the business, but the business sectors we operate in have diversified a lot, and so our mission statement has reflected that. BPE: What is the secret to building a great investor desk? JL: I think the secret in that is to not have to have investors. I most admire businesses that are privately held and don’t need to go to the market and to private equity for funding. I think one of the things people make a serious mistake in is that, for a lot of people, raising money becomes an end unto itself. I don’t think that’s the right way to look at a business. Raising money is a means to an end. The end is whatever the business is doing, which goes back to the question about a mission statement. A lot of people today are caught up in a get-rich-quick scheme and entangled in this idea of raising venture funding. Some of that becomes almost indistinguishable from a ponzi scheme. I think that is a misperception about what a real business is all about. BPE: May I ask what you do to relax? JL: Well, I guess you know, if you’ve run a small business, you really don’t have much time to relax. So, the answer to that question is I have no idea. Most of my pastimes have something to do with my day job. I grew up heavily involved with model aviation, model airplanes, model rockets. Today I’m active in what we call the STEM education outreach (which stands for science, technology, engineering and mathematics). I’m no longer building models but am mentoring and coaching the next generation – doing whatever I can to help kids to discover their passion. The best advice I ever heard was, “Figure out what you love to do, then figure out how to get paid for doing it.” While that’s kind of trite, it’s true. Any of these things are gonna have enormous challenges and setbacks; days where you say, “Why am I doing this?” So you’ve got to really love it to keep going. One of the things most people don’t appreciate about running your own business, is they’ll say, “Well, at least you can’t get fired!” which is true. But on the other hand, you can’t just quit. I think people don’t appreciate what it means as an employee to just throw down your badge when things get really bad. I often envied people who can do that, because as the person who started this business, I don’t have that option.